With a background as an engineer, I have to admit that one of my default computer tools is a spreadsheet. I have a spreadsheet for my family budget, a spreadsheet tracking how many miles I have walked this year (I have walked over 1,500 and am aiming for 5 miles a day or 1,825 miles in 2015), and I use spreadsheets almost daily to track information about the quilts I make. I have a spreadsheet for each commissioned quilt that I use to calculate the final price. And I use spreadsheets to help me with quilt related math. 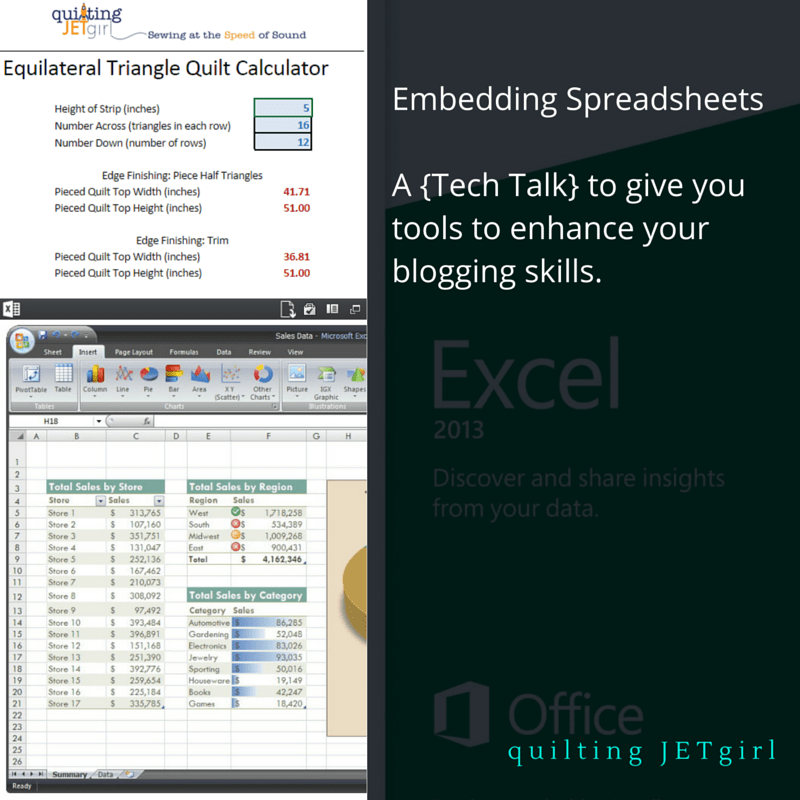 Recently, I even shared one of my spreadsheets with the quilting community in the form of the Equilateral Triangle Quilt Calculator. I really wanted to make the calculator a tool that could be easily used, downloaded, and accessible through my website, and I was really excited to find a way to do that. So today, I am giving an overview of how you, too, can embed spreadsheets into your blog or website. There are other spreadsheet tools available, but I want to focus on the main two choices that you have available: Microsoft and Google. As I have Microsoft Office installed on my computer (Excel, Word, PowerPoint), I tend to use them as my default tools. However, you do not have to shell out money to have access to these kind of tools. 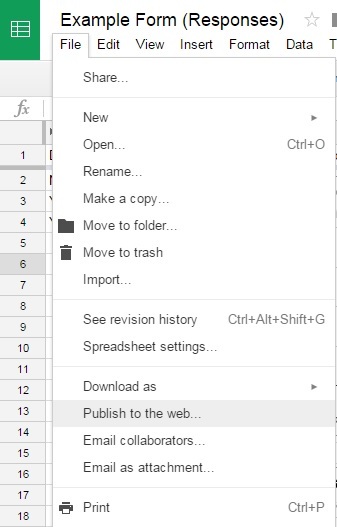 Google Docs provides free online resources for documents, spreadsheets, slideshows, and forms. Microsoft has also recently made some of the functionality of their tools available online as well via Microsoft Office Online. One drawback of Microsoft Office Online is that not all of the functionality is available online. Functionality like worksheet protection, which I used to keep users from accidentally overwriting the formulas for the output in the Equilateral Triangle Quilt Calculator. The details on how to embed these tools into your webpages can be found in the links below, and it really is as simple as pasting in some HTML, which every major blog host allows (even finicky wordpress.com, who hosts my site)! Just linking to the instructions for how to embed seems a bit too easy, so I thought I would walk you through a nifty example. So, let’s play with a Google Form. Google Forms are fun because the outputs are saved in a Google Sheet, so we get to explore two different embed options! First, I created a simple example form with two yes and no questions. Once the form was created, I went to File > Embed… (as shown in the screen shot above) and pasted the HTML code below. Feel free to fill out the form below! 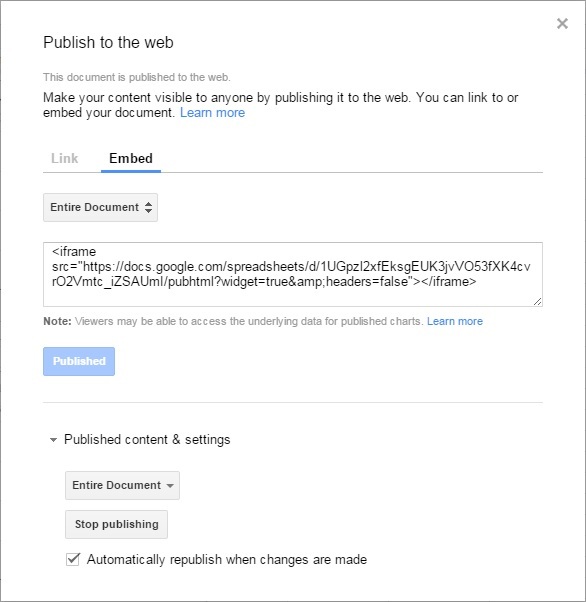 Then click on “Embed” (the default is “Link”) to get the HTML code to paste into your webpage. And as you can see above, I added in two fun charts to show the distribution of Yes versus No in the responses to the form. And I have found a bug! The charts are not updating in the embedded format. The form responses update, but not the graphs. Very interesting. To close, I thought I would add in additional sources for you to refer to if you don’t know how to embed HTML in your particular blog host. I hope this gives you some ideas and tips on how to incorporate new tools into your blogging “toolkit”! This is a very interesting and helpful post Yvonne. Sometimes I forget that my blog can be so much more than just posts w/pics. Thanks for sharing the links, I’ve already found some tips that are going to be helpful. Good and clear information. I use Open office for my spreadsheets, I don’t use them as much as you do that’s for sure. You boggle my mind! I am so not techy! I appreciate everytime you share your knowledge Yvonne! I just can’t wrap my mind around this kind of stuff! It’s hard enough trying to maintain and make my blog look good! This is so cool!. Thank you for sharing this, Yvonne. I can’t wait to put it into use. I know that this blog post is going to be visited thousands of times by people from all different industries. You did I saw a great service by posting it!! Yvonne, Thank you for sharing this information! I am still trying (and failing most of the time) to update my blog and this information will be bookmarked for later use. I hope that you have a wonderful creative day! Wow! Thanks for sharing. I have saved this for later. Thanks for sharing this info. With my accounting background, I too am a proud spread sheet nut and use them for everything. It had never crossed my mind that we could incorporate them into our blogs. Thank you for sharing this. It’s such a useful tool. This will be very beneficial for a lot of people. I’m standing by my tool guru comment! And it’s been an interesting mix of posts I’ve just caught up on, I feel like they’ve built up a really strong picture of your quilting/creative identity and process. As much as I’d rather not get so far behind with my following I do think reading a big lump like this made that so much more obvious. You do clearly have a consistent blog/creative identity, and yet you have such a good variety in there too, it’s felt like a very happy balance! And I’m off to bed now, happy in my up to dateness! Great info Yvonne. When I worked full time I was fanatical about spreadsheets but I don’t use them as much in my everyday life. I hadn’t really thought to use them in my blog, but now I at least know how! Thanks! I like spreadsheets, but my husband LOVES them. We jokingly call him Spreadsheet Man, which is a form of superhero, with a cape and underpants on the outside and everything.